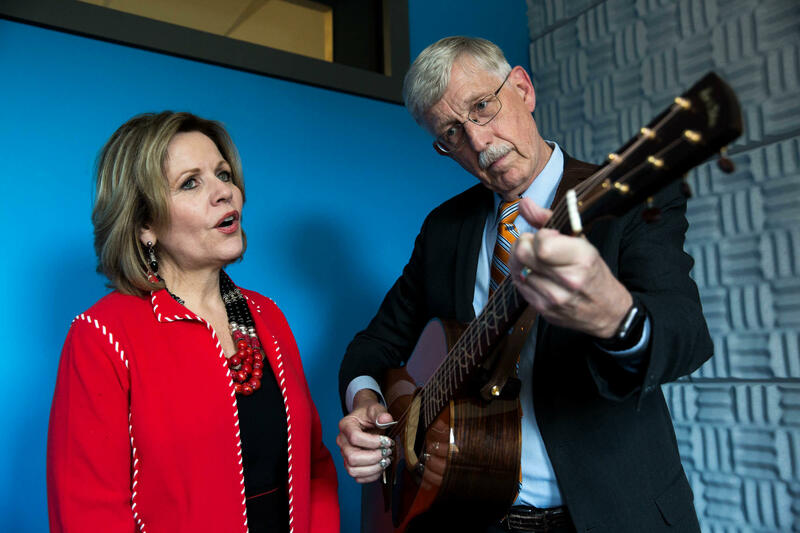 NIH Director Francis Collins and Renée Fleming, who is Artistic Advisor at Large for the Kennedy Center in Washington, D.C., sing a duet. She is also an Artistic Advisor at Large to the Kennedy Center in Washington, D.C., and the two of them are joining forces this weekend for a program called Sound Health. The two-day event will explore connections between music, health, wellness and science through musical performances and presentations from neuroscientists. All Things Considered host Robert Siegel spoke with Fleming and Collins about their work together and what they hope to convey to the public about the intersection between art and science. They also sang a duet. The conversation has been edited for length and clarity. Fleming: We met unexpectedly at quite an extraordinary dinner party. Collins: It was two years ago. It was on a Saturday night. It happened to be the Saturday night after the Supreme Court had issued their final decisions for 2015, and three of the Supreme Court justices were present. So, having a little unwinding going on there, because they had been on different sides. We had Anthony Kennedy, we had Ruth Bader Ginsburg, and we had Antonin Scalia, all gathering to have a wonderful dinner and a little music, which was provided by a sort of ok band — which, somehow, I think we took over. Fleming: We had an interesting conversation that night at dinner, because I said "Do you think that we could collaborate with these two institutions? Put something together to amplify the work being done in this field?" and he didn't hesitate. Collins: I think it's increasingly becoming clear that must be the case. One of the really exciting findings that has recently come forward as we have better means of imaging the brain, [is] that if you put somebody in an MRI scanner and you look to see which part of the brain is getting activated when you hear a voice or when you hear a musical sound, they're different. Your brain has a music room, and evolution would not have gone to the trouble of designing that if it didn't have some benefits. So, that suggests to me that we and our ancestors have had music as a central part of our experience for eons. And we're just beginning to understand how that might be. I think that's fascinating. Fleming: The brain has to support me in my singing, no question. Having to memorize in foreign languages that I don't even speak is an arduous task. I participated in a study at the NIH. I was in an fMRI machine for two hours, singing this tune, [The Water is Wide], imagining it and speaking it. It's not an attractive sound, especially because I'm competing with the sound of the machine, but it's incredible to see the pictures — how it looks with the revolving brain and all the parts that are activated in this fMRI under those three different circumstances. It's all quite different. Collins: For me it's both a basic science opportunity, to use what we're learning about how music affects the brain to understand the brain better, but it's also got this therapeutic implication. Music therapy can be incredibly powerful for kids with autism, adults with Alzheimer's and everything in between, but we don't really understand most of the time how it works. We can give this field a stronger scientific base, and it can be even better. Collins: We're just bold enough to think that we might be able to figure out how the circuits in the brain do what they do, and use that information to help people with many different disorders that affect the brain, including mental illness, including epilepsy, including traumatic brain injury. Music is part of that need for understanding. So, even though we've never been in a position where I would say we have enough resources, we would certainly want to prioritize this effort. This week, we've been reporting on the intersection of music and neuroscience. And today we are joined by music and science personified. Renee Fleming is one of the great sopranos of our time, and she's also artistic adviser at large to the Kennedy Center here in Washington, D.C. Welcome to the program. RENEE FLEMING: Thank you, Robert. SIEGEL: And Dr. Francis Collins is director of the National Institutes of Health. He's a physician and a renowned geneticist. And as we'll hear shortly, he also plays a mean guitar. Welcome. FRANCIS COLLINS: Thank you, Robert. It's a thrill to be on your program. SIEGEL: Renee Fleming and Francis Collins are collaborating on a program this weekend at the Kennedy Center called Sound Health, exploring connections between music, health and wellness and science. There will be performances and presentations. And Renee Fleming, perhaps you could start by telling us about the origins of this partnership. FLEMING: Well, I've been interested in the subject for a long time mainly by being an armchair reader of news and discovering that every month or so, there'd be some new story about research on music and the brain. And we met unexpectedly at a quite extraordinary dinner party. Francis, do you want to talk about that? COLLINS: ...Which - somehow I think we took it over - something like that. SIEGEL: So the two of you and three Supremes and you perform. How did that go? FLEMING: That sounds like a group. FLEMING: Now, we kind of were icebreakers, I would say. COLLINS: ...Particularly topical moments. Bob Dylan sort of brought forward to the Supremes at that moment. It just seemed right. FLEMING: We had an interesting conversation that night at dinner because I said, do you think that we could collaborate with these two institutions, put something together to amplify the work being done in this field? SIEGEL: NIH and the Kennedy Center. FLEMING: Yes, and he didn't hesitate. COLLINS: Not at all. What an opportunity. SIEGEL: Renee, when you said that, I mean, what are the questions that you're most curious about in terms of the brain and music? FLEMING: Well, first of all, I've learned a great deal in the last two years. I find that the disciplines actually as applied to music and to learning for children are quite extraordinary. The research absolutely underlines children having some sort of music instruction in their learning - and then when you talk about the therapies themselves, music therapy and how it's used. And finally, the basic research I find fascinating I mean to just - to really think about the fact that we probably had music before speech. SIEGEL: Is that true that - is it received that we probably were singing before we were speaking? COLLINS: I think it's increasingly becoming clear that must be the case. One of the really exciting findings that has recently come forward as we have better means of imaging the brain in people who are carrying out normal activities - that if you put somebody in an MRI scanner and you look to see which part of the brain is getting activated when you hear a voice or when you hear a musical sound, they're different. Your brain has a music room, and evolution would not have gone to the trouble of designing that if it didn't have some benefit. So that suggests to me that we and our ancestors have had music as a central part of our experience for eons, and we're just beginning to understand how that might be. I think that's fascinating. SIEGEL: And I was thinking about how when you must be singing, Renee Fleming, I mean I assume you're concentrating on your vocal chords and your lungs and your mouth. I mean are you thinking about your brain at all during that time? FLEMING: Well, you know, the brain has to support me and my singing, no question. I mean having to memorize in foreign languages that I don't even speak is an arduous task. And I participated in a study at the NIH that we will unveil. FLEMING: I was in an fMRI machine for two hours, singing this tune, imagining it and speaking it. SIEGEL: ...The cat out of the bag here. SIEGEL: The - but you were in what for two hours? COLLINS: Not for the fainthearted. COLLINS: You're lying there with a lot of noise. SIEGEL: Were you enclosed in it during this time? SIEGEL: They had you singing like that. FLEMING: Singing, exactly. We're not going to win Grammys for this. FLEMING: It's not an attractive sound, especially because I'm competing with the sound of the machine. But it's incredible to see the pictures. And we will share them with the audience tonight how it looks and with the revolving brain and how all the parts that are activated in this fMRI under those three different circumstances. And it's all quite different. SIEGEL: ...See what's going on inside the singer's brains as they're performing. COLLINS: And maybe the audience, too. SIEGEL: And maybe (laughter) and maybe the audience. SIEGEL: Before I ask you to oblige us with a performance, I'm just curious, first, Dr. Collins. I mean for you, what are some big frontier questions that scientists should be looking at right now about the brain and music? COLLINS: It's a very exciting moment because we do have the opportunity with many of these imaging approaches to see what's happening in the brain of a performer or a listener. We already have some idea what happens when you're listening to a piece of music that particularly moves you. You may even get the chills. What's going on in your brain? Well, you're actually lighting up dopamine in your ventral striatum, which is pretty interesting as an indication of what that very powerful emotion is represented by in neurotransmitter land. That kind of thing we couldn't have said until recently. For me, it's both a basic science opportunity to use what we're learning about how music affects the brain to understand the brain better. But it's also got this therapeutic implication. Music therapy can be incredibly powerful for people, kids with autism, adults with Alzheimer's and everything in between. But we don't really understand most of the time how it works. We can give this field a stronger scientific base, and it can be even better. SIEGEL: I'm going to ask you now to engage in something therapeutic for people who are perhaps not suffering from some of the ailments you've described, but a Friday afternoon driving home is pretty rough also. So I'm wondering if the two of you could perform for us a song. Can you tell us a bit about what you'll play? FLEMING: Well, this is a song I'm actually performing tonight with orchestra, and this is "The Water Is Wide." SIEGEL: "The Water Is Wide." FLEMING: It's a U.K. song that came to the Appalachian Mountains and has been really loved and adopted by us as well. (Singing) The water is wide. I cannot cross over, and neither have I wings to fly. COLLINS AND FLEMING: (Singing) Give me a boat that can carry two, and both shall row my love and I. There is a ship, and she sails the sea. She's loaded deep as deep can be but not so deep as this love I'm in. And I know not how I sink or swim. SIEGEL: Bravo. Renee Fleming and Dr. Francis Collins of the National Institutes of Health, thank you both so much. SIEGEL: And you can listen to that performance again and hear our other stories about music and the brain at our website, npr.org. Transcript provided by NPR, Copyright NPR.